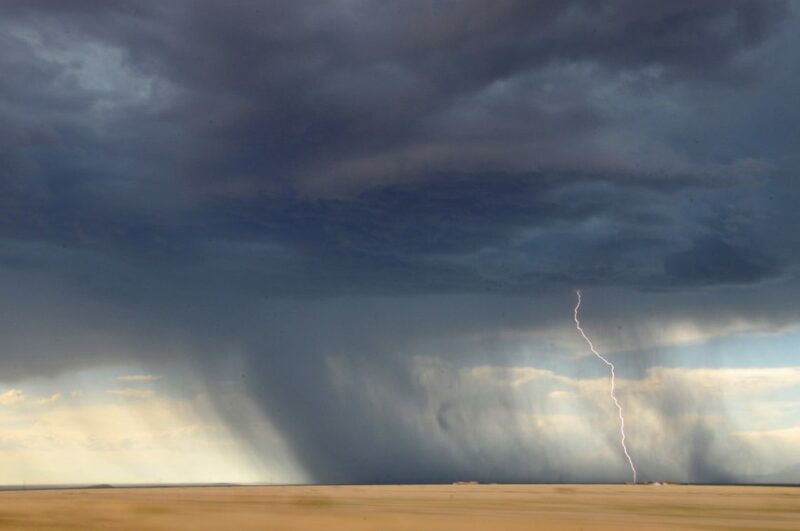 Contrasting the common belief, flash floods in arid climates occur quite often when the convective storms typical of these areas hit the fast-responding dry soils. Convective storms are caused by strong vertical motions of moist air masses driven by buoyant instability and are highly effective in condensing moisture into rainfall. These systems usually generate high rain intensities over small areas. In these conditions, flood response is driven by the interactions between rainfall and the basin in space and time so that the spatiotemporal variability of rainfall is a key factor dominating the flood magnitude. Adequately measuring rainfall in space and time is thus crucial for monitoring, modeling, and issuing flood warnings. Owing to their large spatial and temporal variability, convective storms are still difficult to monitor in space and time, despite the number of sensors currently available. Rain gauges measure rainfall at the point-scale with high temporal resolution or integrate it in time. Conversely, remote sensors aggregate the measurement in space and sample the time dimension in different ways. The questions we wanted to answer with this study are: what sensor(s) are required to adequately measure convective rainfall in arid areas? What does adequately mean? We focused on the eastern Mediterranean, specifically on the arid basins draining westerly to the Dead Sea. Despite the relatively small amount of yearly rainfall (up to 100-500 mm yr-1), these basins are often subject to flash floods that cause casualties and damages. Readers interested in the characteristics of flash-flood triggering rainfall in the area will find detailed information in Belachsen et al. (2017). We took advantage of the extremely high resolutions (60 m, 1 min) of an X-Band weather radar recently installed by the Dead Sea Drainage Authority for flash flood monitoring and warning. The instrument, of relatively low cost, was developed by EnviSens Technologies and maintained by the Hydro-meteorology lab at the Hebrew University of Jerusalem. This is among the first instruments measuring rainfall in arid climates with such resolutions, and permits to resolve the small-scale variability of convection with unprecedented detail. Since quantitative radar estimates suffer from several sources of error, the raw radar data were corrected following physically based algorithms and adjusting the large-scale rainfall amounts to the measurements of a coarser-resolution C-Band weather radar covering the area. The reader is referred to the original article (Marra and Morin, 2018) for a detailed description of these methods. A set of 11 highly convective storms was selected from the archive depending on radar data quality. The selected storms were characterized by durations ranging between 6 hours and 5 days, rainfall total depths peaking between 17.2 mm and 99.1 mm and wet area ratios (fraction of the areas experiencing rainfall in any moment during the storm) ranging between 10% and 90%. The rainfall hitting the ground varies in space (2 dimensions) and time (1-dimension) and can thus be considered a 3-dimensional scalar field. A commonly used metric to quantify the variability of scalar fields is the autocorrelation, that measures the similarity of two elements of the field as a function of the distance separating them. Conventionally, the distance at which the autocorrelation decreases by a factor 1/e is termed decorrelation distance and is used to measure the distance at which information is lost. In this study, the spatial and temporal autocorrelation of high-resolution radar rainfall fields was quantified separately. Convective rainfall fields were identified as radar rainfall fields in which at least one convective rain cell was observed. Convective rain cells were defined, using image processing, as connected regions larger than 3 km2 in which rainfall intensity exceeded 10 mm h-1 and featuring a peak intensity exceeding 25 mm h-1. In total, 5469 convective rainfall fields were observed during the examined events. The 2-dimensional spatial autocorrelation of a convective field was computed using the Wiener-Khintchine theorem. The 1-dimensional spatial autocorrelation of each convective field was then derived fitting to the 2-dimensional autocorrelation a 3-parameter exponential. The temporal autocorrelation was computed separately for each 60-m radar pixel isolating the rainfall time series and the decorrelation distance was computed fitting to them the 3-parameter exponential function described above. Large rainfall spatiotemporal variability of convective rainfall was observed. The spatial decorrelation distances of convective rainfall fields were usually between 1.5 and 3 km, and mostly shorter than 5 km. The temporal decorrelation times of the convective storms were between 2 and 7 min, and rarely exceeding 10 min. The spatial and temporal decorrelation distances strongly challenge the sensors currently used for operational monitoring in arid regions. In case of rain gauge networks efficiently deployed, a station every ~3 km2 would be necessary to sample these spatial scales, while operational networks are, in general, at least 30 times less dense. This explains the scarce representativeness of operational typically reported in arid climates and convective conditions. Few dense networks are indeed available, but offer only limited areal coverage and require abundant maintenance efforts. In terms of remote sensors, the observed spatial scales are comparable to the resolution of C- and S-Band weather radars (typically 1-2 km), but much smaller than the resolution of satellite-based products (reaching 4-8 km, but typically 10-25 km). Commercial microwave links offer highly variable spatial resolution depending on their length (<1 km), however in less populated areas such as arid areas, their length is usually long since only a few towers are deployed. For instance, in the areas covered by this study, microwave link paths are at least ~10 km in length. The typical temporal sampling resolution of weather radars (generally 5-10 min), can barely provide complete information for the examined convective storms, while satellite-based estimates, based at best on 30-min resolution data, are expected to provide seriously flawed information. The same holds for microwave links data that, despite the potential availability at very high resolution (even <1 min), are generally provided by the cellular companies at coarser temporal resolutions (~15 min). Rain gauges, even if providing data at coarse temporal resolution, aggregate the information in time (rather than providing the time snapshots of remote sensors) and are thus providing the full rainfall depth delivered by the storm over their location. Combining information from different sensors in multi-sensor rainfall estimates exploiting the strengths of each sensor represents a viable way to improve rainfall estimates, however, it still represents an open challenge for arid areas, where data availability is limited and convection dominates rainfall climatology. These findings are described in the article entitled Autocorrelation structure of convective rainfall in semiarid-arid climate derived from high-resolution X-Band radar estimates, recently published in the journal Atmospheric Research. This work was conducted by Francesco Marra and Efrat Morin from the Hebrew University of Jerusalem. Francesco is a research scientist at the Hebrew University of Jerusalem, Fredy and Nadine Herrmann Institute of Earth Sciences.